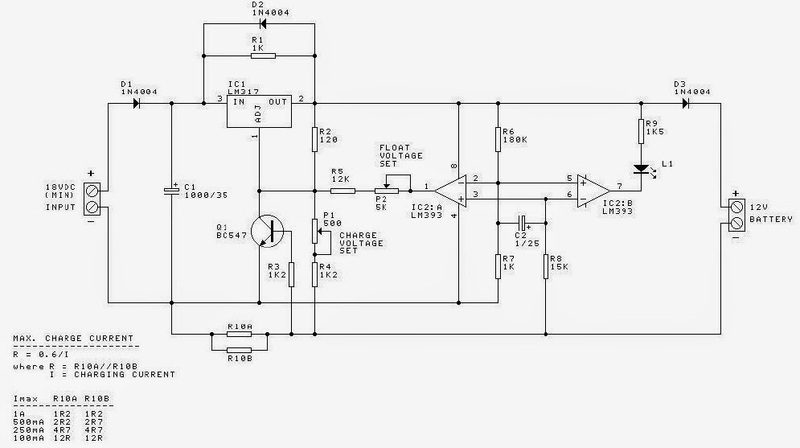 This is the circuit design of Smart Sealed Lead Acid (SLA) 12V Battery Charger featuretwith Current Limiting. The charger uses a two step process for charging SLA batteries – a current limited ‘fast’ mode followed by a constant voltage ‘float’ mode. Maximum charging current is 1A. An onboard LED indicates when the charger is in ‘fast’ mode. When the LED goes out the battery is charged and the charger has switched to ‘float’ mode. The best way to charge a Sealed Lead Acid (SLA) battery is with a current limited voltage regulator, allowing fast charging while limiting heat buildup and gassing. SLA batteries are made up of 2V (nominal) cells. The charging current should be approximately 0.1 times the battery capacity. So, a 10Ah battery should be charged with a 1A current (10 x 0.1 = 1). This helps to ensure battery life. Step 1. Charging starts at the maximum current limit. The battery terminal voltage will gradually increase until it reaches the regulator set voltage. Step 2. As the battery becomes fully charged the current will start to decrease. When the charging current drops to around 140mA (see later) the regulator voltage is decreased to a safe float voltage at which the battery can be left on indefinitely.